To commemorate 25 years of service, each month this year the Armenian EyeCare Project will feature a key element of our organization that has allowed us to bring eye care to the people of Armenia. Last month, we wrote about our partnership with USAID, which has made it possible for us to offer eye care to the most vulnerable populations in Armenia. This month, we share with you our strategy for delivering eye care to hundreds of thousands of people in Armenia — a comprehensive, five-point program that works. Our five-point strategy for delivering eye care to Armenia developed around the same time as our partnership with USAID, in 2004. Launching our first major initiative with the foreign aid agency, the Armenian EyeCare Project thought it paramount to establish a comprehensive strategy that would go beyond simple medical aid in Armenia and allow the benefits of our program to last for generations. As such, we came up with an integrated five-point strategy that would allow us to deliver eye care in Armenia in the most effective and sustainable way: (1) direct patient care; (2) medical education and training; (3) public education; (4) research; and (5) capacity building. The AECP delivers direct patient care in Armenia through our several programs. They include our Mobile Eye Hospital that travels throughout the country; the Subspecialty Eye Clinics in Yerevan, which cover specialties like retina, glaucoma, corneal-uveitis, neuro-orbital, pediatrics, and low vision; our Regional Eye Clinics currently being developed in five provinces throughout Armenia; the Center of Excellence for the Prevention of Childhood Blindness in Yerevan, which combats infant and child blindness; and our annual Medical Missions. In the beginning, direct patient care was provided only when our U.S. physicians traveled to Armenia during twice-yearly Medical Missions. But, through advanced medical education and training, many of Armenia’s physicians and medical personnel have now been trained to offer quality care to their countrymen themselves. Today, in addition to U.S. ophthalmologists offering care during Missions, Armenia’s ophthalmologists offer care year-round through our Mobile Eye Hospital; Subspecialty Clinics; Regional Eye Clinics; and Center of Excellence. To date, the AECP has screened over 500,000 patients in Armenia; performed nearly 20,000 sight-saving surgeries; reduced infant blindness in Armenia by 90 percent; and provided prescription eyeglasses to more than 70,000 Armenians in need. Medical education and training is the cornerstone of the Project’s program. What started as a group of U.S. physicians traveling to Armenia to offer eye care during Medical Missions soon evolved into an opportunity to also offer advanced training for physicians, nurses and other medical staff in the country. The U.S. doctors realized they could not possibly meet the medical needs of the country through twice-yearly trips; they opted to develop a living, breathing program that continued to work while they were away. In addition to training Armenia’s physicians during Missions to the country, AECP Founder Dr. Roger Ohanesian, along with a team of other doctors, established a Fellowship Program that would sponsor Armenia’s top ophthalmologists to travel abroad for one year and train at the finest medical institutions under the mentorship of some of the best physicians in the world. These Armenian ophthalmologists would then return to Armenia to establish and direct clinics in their subspecialty and train their own colleagues, creating a domino effect of extensive medical education and training in Armenia commensurate with U.S. eye care. Telesurgery is also a big part of the AECP’s medical education and training. The cutting-edge technology allows physicians in Armenia to receive advanced surgical training from expert surgeons across the world in real-time. Without leaving Armenia, physicians are taught to perform technically advanced procedures with confidence and with assistance and support from experts. Cameras attached to surgical equipment transmit real-time audio and high-resolution video images allowing the teaching surgeon to view the surgery in Armenia. To date, the AECP has trained over 1,000 primary care and family practitioners in ophthalmology; 200 nurses and technicians in ophthalmology; and 72 neonatal nurses and technicians on ROP, an eye disease that affects premature infants. 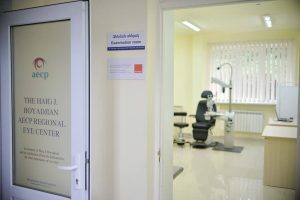 As well, over 16 international teaching conferences on ophthalmology have been held in Yerevan and a state-of-the-art AECP Education Center, Library and Diagnostic Center have been established to facilitate medical education and training for physicians, nurses and medical staff in Armenia. Public education and outreach is a key component of our strategy to eliminate preventable blindness in Armenia. 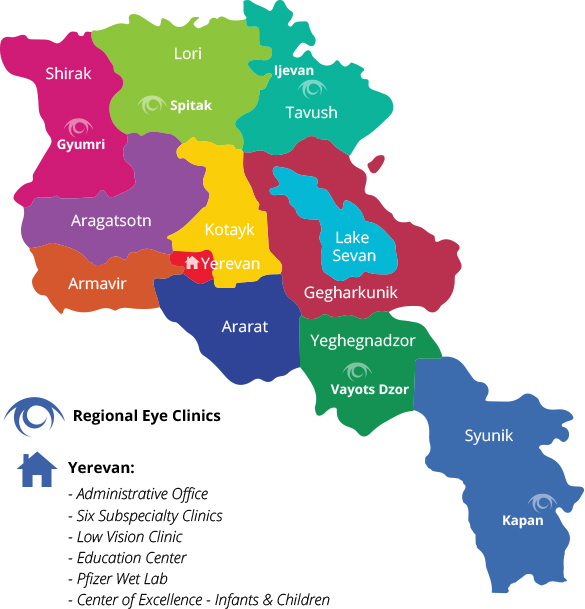 Through country-wide media campaigns including radio and television public service announcements (PSAs), community events and school visits, we aim to inform Armenia’s public about the importance of eye health and the steps residents can take to ensure they have healthy vision for years to come. 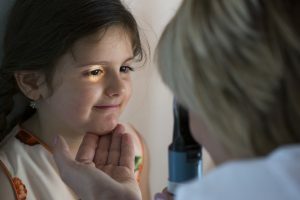 With a focus on prevention and early intervention, our public education initiative includes identifying children’s eye disorders, some of which require swift treatment, to students, teachers and parents; going over good eye safety practices during work or leisure for both adults and children; and describing common signs of eye problems and risk factors of eye disease. Through our public education efforts, the AECP has distributed more than 800,000 educational materials on eye care; produced hundreds of TV and radio PSAs; and organized local community events, including visits to over 400 public schools, all in the name of promoting healthy behaviors for eye care. Eye disease — primarily cataract, glaucoma, and diabetic retinopathy — is a major public health issue in Armenia. Yet, oftentimes, there is no reliable data available on these issues for Armenia’s population. That is why we have incorporated a research component into our five-point strategy. By taking steps to advance medical research into several eye diseases, the AECP is able to further disease prevention and improve overall health in Armenia. Information is collected during eye screenings on the Mobile Eye Hospital and then analyzed. This method, and the close cooperation between AECP physicians and Armenia’s ophthalmologists, has enabled revolutionary eye care methods to be introduced in Armenia. This includes ways to prevent glaucoma and, more recently, diabetic retinopathy and other diabetes-related eye diseases. Our new Diabetes Program includes a critical research component that will allow physicians to spot early signs of diabetes-related eye disease. The AECP will photograph the retina of each patient diagnosed with diabetes every year. The images will then be evaluated by physicians for signs of disease and the assessments will be recorded. This will enable physicians to observe and evaluate early retina changes and treat patients so they can protect their sight before it is too late. Helping Armenia develop an eye care delivery system, which will enable the country’s physicians to independently deliver quality eye care to the Armenian people, is the AECP’s major, long-term goal. This is accomplished by building Armenia’s capacity through the development of human and physical resources, which include physician training programs and facilities like our Mobile Eye Hospital, Subspecialty Eye Clinics, a $1 Million Pfizer Wet Lab for training and Regional Eye Clinics being developed throughout Armenia, two of which are complete and three more that are in progress. In addition, more than $60 million in medical equipment and supplies has been donated to Armenian hospitals and clinics by U.S. medical manufacturing and pharmaceutical companies and individual donors. These generous gifts ensure that Armenia’s ophthalmologists have the most up-to-date medical equipment to treat their patients at a level equal to the United States and other developed countries.